Why iPhone Users Should Process Videos with VideoProc? •	Inability to play MKV, FLV, AVI videos on iPhone. •	Failure to play 4K HEVC iPhone videos on other devices. •	Inability to import iPhone HEVC, VBR videos to Premiere. •	Wastage of time in uploading large 4K, HD videos to YouTube. •	The video exceeds the length limit of video sharing sites. •	The video image is cropped after uploading to Instagram. •	Non-standard aspect ratio videos are played with letterbox. •	Inconvenience in editing videos on iPhone's small screen. •	Complicated edit operations with iPhone. •	Inability to export 4K 60fps videos after editing on iPhone. •	iPhone gets stuck or turns slow when editing large videos. •	HD video quality turns bad after uploading to YouTube. •	The red bar on the videos recorded by iPhone screen recorder. •	Shaky videos and noisy video image. •	Videos shot at night are dim and blurry. Give it a whirl and you will be pleased to see how effortlessly VideoProc sweeps you out of the troubles. •	It consists of an easy-to-use editing toolbox where you can cut, crop, adjust, and add filters to 4k, HEVC videos with a single click and make them better for uploading to YouTube, Instagram, Facebook, Twitter, Vimeo etc. •	It supports abundant audio/video codes and enables users to transcode videos among 400+ formats such as MP4, AVI, MOV, HEVC, MP3, WMC, etc. 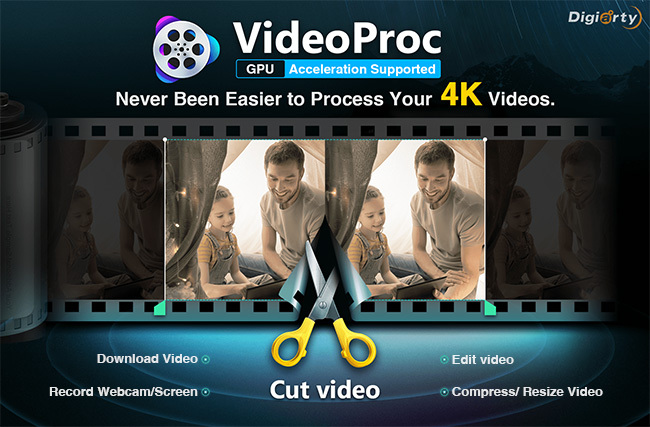 •	VideoProc comprises a high-quality compress engine that reduces the video size by 90%+ and saves the storage space and time to upload to Instagram, Facebook, YouTube, etc. •	The software digitizes any DVDs to common video formats for playback on portable devices. •	It captures screencast on computer and iPhone. It has never been easier to meet all your video editing needs efficiently. VideoProc allows the iPhone users to process large 4k videos effortlessly. The users can now stabilize shaky videos, correct fisheye distortion, adjust color and brightness, add watermark, and apply other effects to the videos. VideoProc’s unique technology expedites video transcoding and processing while optimizing the file size and output video quality. It solves the incompatibility issues and lets the iPhone users play videos on Mac, Android, etc. The software also allows transcoding the iPhone ringtones and videos to MP3 for iPhone. Get 47X real-time faster output with the Level-3 Hardware Acceleration! Resizing the videos has become easier with VideoProc as the iPhone users can now adjust the settings, bit rate, frame rate, etc., change resolution, upscale/ downscale video, etc. VideoProc is the best mate to get a high compression ratio without quality loss. 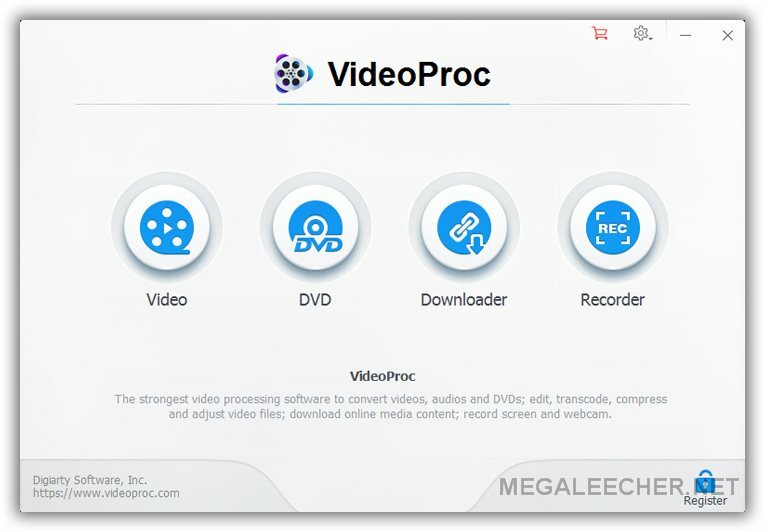 The videos processed using VideoProc are the best to upload on various platforms, to share via emails, texts, WhatsApp, etc., to watch on any media device, and to backup via the cloud, computer, USB, hard drive, etc. •	47 times faster video processing speed due to Level-3 Hardware Acceleration. •	Robust abilities in processing 4k, high frame rate, and large videos. •	Compatible with all video formats. •	Decodes and encodes VBR and HEVC videos. •	Lossless output video quality due to the High-Quality engine and Deinterlacing technology. •	Integrates the features from dozens of software. •	Fully featured with basic and advanced video processing tools, suitable for both advanced users as well as amateurs. •	Easy-to-use and understand user interface and operations. •	Finishes video processing tasks in a few clicks. •	Stable operations to get rid of the forced termination and stuck problems. Love shooting videos with iPhone? Learn about processing tips and tricks and get a chance to win VideoProc license, iPhone XS, and many more. Participate in the sweepstake campaign and win licensed VideoProc, iPhone XS, airpods, and iPhone cable. The rules are simple. Enter the campaign landing page and submit a valid email address to join the campaign for free. Follow us on Facebook, Twitter or share the campaign on social media to get more entries. The prizes include iPhone XS ($ 999), AirPods ($159), iPhone charger cable ($12.99), and 2000 copies/day of VideoProc license key ($78.90). Hurry!! Try your luck before the campaign ends on November 30, 2018. 1. The winner of iPhone XS will be chosen from ALL the participants. 2. We will use randompicker.com to pick up the winners. The winner information will also be uploaded on official Facebook and Twitter. What are you waiting for? Go!! Get yourself going! !